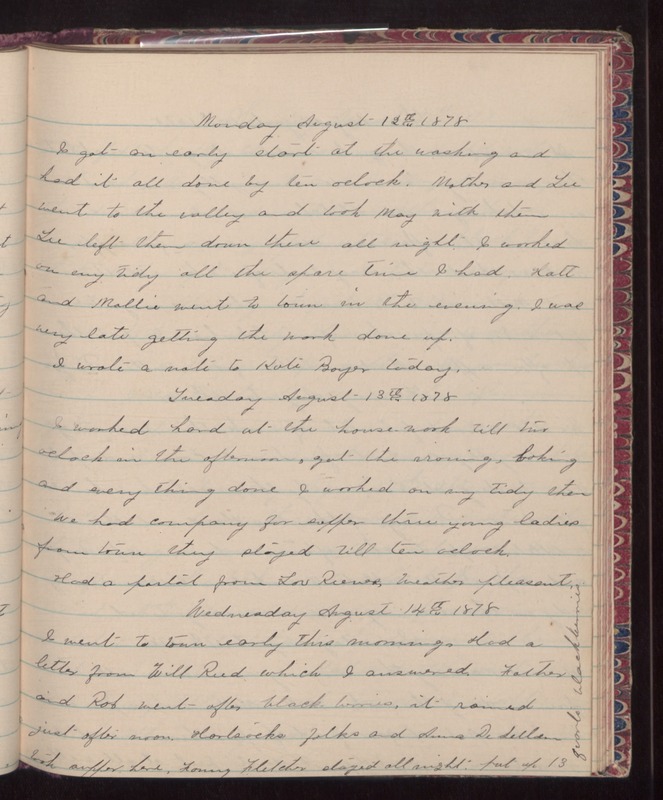 Monday August 12th 1878 I got an early start at the washing and had it all done by ten oclock. Mother and Lee went to the valley and took May with them. Lee left them down there all night. I worked on my tidy all the spare time I had. Hatt and Mollie went to town in the evening. I was very late getting the work done up. I wrote a note to Kate Boyer today. Tuesday August 13th 1878 I worked hard at the house-work till two oclock in the afternoon, got the ironing, baking and every thing done. I worked on my tidy then. We had company for supper three young ladies from town they stayed till ten oclock. Had a postal from Lou Reeves. Weather pleasant. Wednesday August 14th 1878 I went to town early this morning. Had a letter from Will Reed which I answered. Father and Rob went after black berries, it rained just after noon. [Hortsocks?] folks and Anna De Sellan [?] took supper here. Fanny Fletcher stayed all night. Put up 13 quarts blackberries.